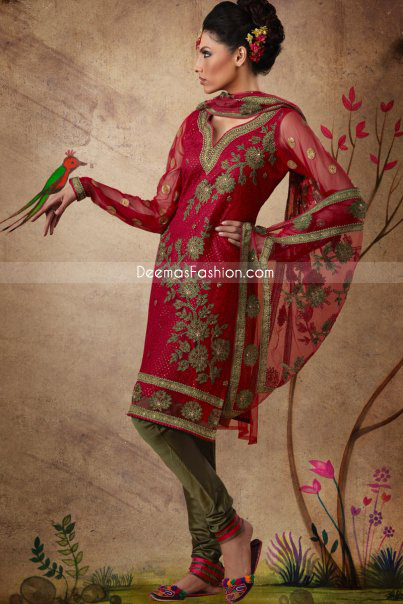 Tags: Churidar Pajama, Dark Red, Full Sleeves, Kameez, Mehndi Green, Party. Top: Red crinkle chiffon long shirt embellished with embroidery on front. High quality pretty embellishments in rounded ornamental motifs, on sleeve and hem, which demonstrate high fashion and femininity. Sleeves in full length with Green embroidered border appliqued finished. Neckline style finished with green embroidered edges. Bottom is enriched with golden border and motifs. banarsi under shirt. Trousers: Green raw silk anarkali style trousers. Finished with piping on edges. Dupatta: Red crinkle chiffon dupatta with heavy embroidery as on shirt.